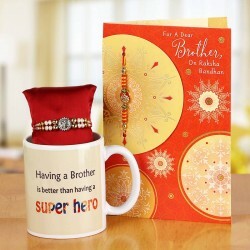 Send a special Rakhi to your Brother on this Raksha Bandhan with MyFlowerTree. 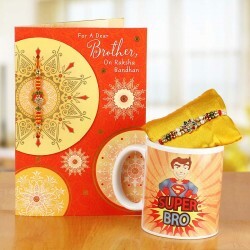 With our special Raksha Bandhan and Greeting Card Combos, you can tell your Brother how much he is loved. 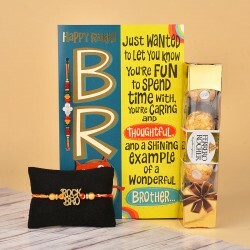 All the Greeting Cards bear special Raksha Bandhan messages that will make this occasion special. 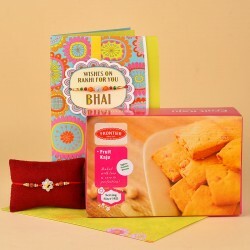 Raksha Bandhan is one of the sweetest festivals celebrated in India. It signifies the unbreakable bond of a Brother and a Sister. No matter where they live now, they will always find a way to celebrate this day. 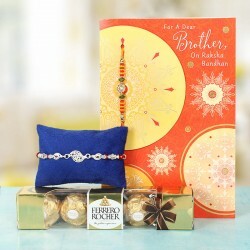 A Sister ties a Rakhi on the wrists of her Brother while he promises to protect her and along with that, a lot of sweets, wishes and other gifts are exchanged. Sometimes, it is really difficult to express what the heart feels. Putting those emotions into words is easier than saying them out loud. 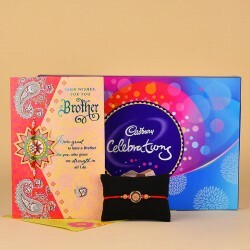 With these special raksha bandhan cards, you can express your lovely emotions to your childhood partners. 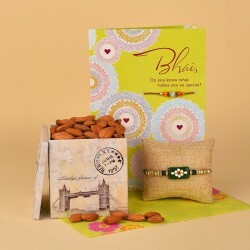 Send rakhi with greeting cards and make this Raksha Bandhan special. These raksha bandhan cards are one of a kind. They have cute and heartfelt messages written in them. They can make anyone happy. Your sister loves you to the moon and back and we know that you do to. 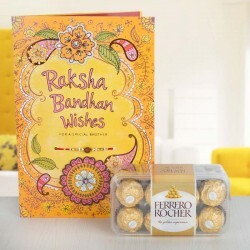 She makes all the efforts to make Raksha Bandhan special for you and with these return gifts for sisters you can make this day happy for her too. You can start with Flowers and Cakes. Our Collections of Flowers include beautiful and Fragrant Roses, carnations, Gerberas, Lilies, Orchids and Birds of Paradise. Our Cake collection has flavours like Black Forest, Chocolate, Strawberry, Pineapple, Mango, Chocolate Truffle, Ferrero Rocher, Coffee, Caramel, Coffee Caramel, Cheesecake, Kiwi, Fruits, Oreo and many more. We also have a wide collection of Chocolates like KitKat, Dairy Milk Fruit and Nuts, Temptations, 5 Star, Lindt, Ferrero Rocher, Dairy Milk Silk, Dairy Milk Oreo and more. We have many homemade Chocolates and Assorted chocolates as well. We also have some of the prettiest earrings, necklaces, bracelets and other jewellery for the best sister. And if your Sister likes Fragrances, we have a huge collection of Perfumes and Colognes as well. 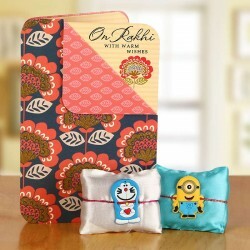 Make your Sister happy with these Raksha Bandhan Return Gifts for Sister. 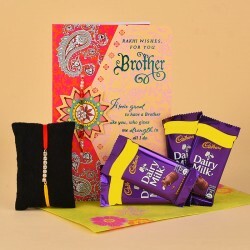 Now send Raksha Bandhan Gifts and Greeting Cards to your Siblings without any delay. Don't wait for another day to come, make it happen today with MyFlowerTree. 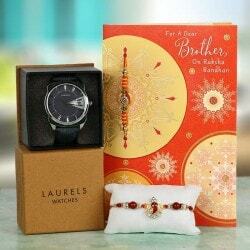 With rakhi same day delivery, no Brother or Sister will have to wait for their Raksha Bandhan surprise. Bangalore, Chennai, Tamil Nadu, Mumbai, West Bengal, Rajasthan, Punjab, Haryana, Delhi, Puducherry, Karnataka, Hyderabad, Chandigarh, Bihar, Jharkhand, Jaipur, Himachal Pradesh, Uttarakhand, Uttar Pradesh and more, our services are available for all the major and remote cities. 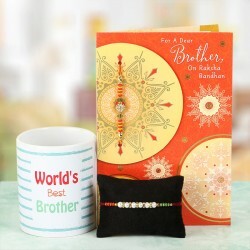 You can even send gifts and Rakhis to your Brothers living abroad. Canada, Dubai, Australia, USA, France, Germany, Africa, Spain, Bangkok and more, our list is endless. No distance can come between you and your Brother.